The time has come to bring the world’s attention to the Jewish composer Aldo Finzi who was on the brink of winning the competition for a new opera which the La Scala Theatre had commissioned in the autumn of 1937 to be staged the following season, just as the anti-semitic laws were about to be enforced in Italy. 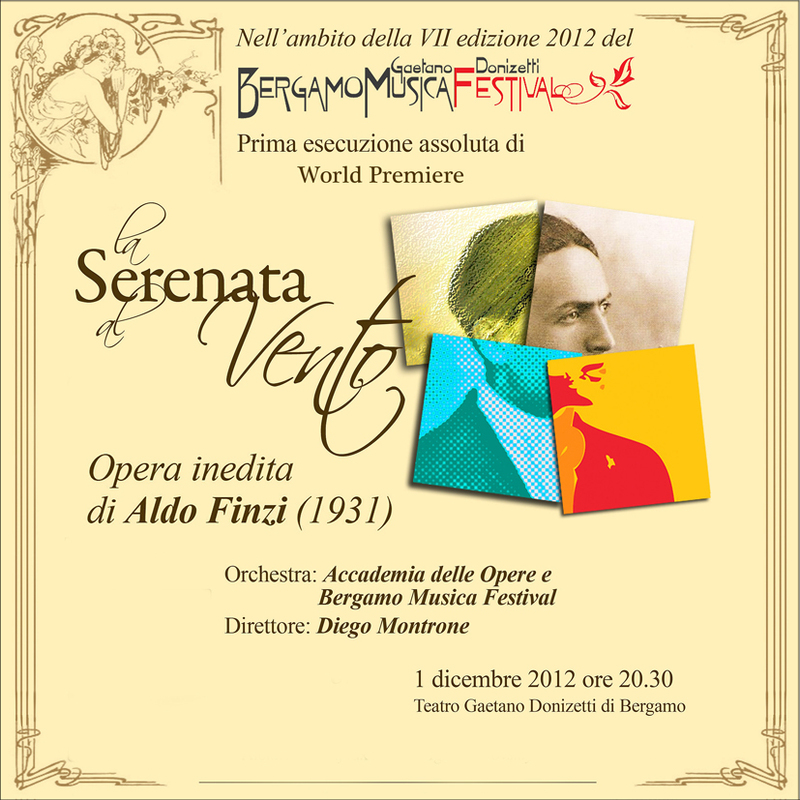 Aldo Finzi presented his playful comedy The Serenade to the Wind to the com- petition and while the evaluation was in progress, Maestro Pick-Mangiagalli, an authorative member of the jury, contacted the young composer informing him confidentially that his composition had been selected to be awarded the 1st prize. However, 1938 was fast approaching with its infamous anti-semitic laws coming into force and without any explanation what-so-ever, the competition was cancelled and all entries disposed off. A recent inquiry at the archives of La Scala revealed no trace of the many scores that were submitted at the time. The recent discovery, revaluation and premiere performance of La Serenata al Vento, aims to compensate for the great injustice to Aldo Finzi who had in fact won the competition, regrettably at the wrong moment in time. The opera is set in three acts to a libretto by Carlo Veneziani, a racy and romantic comedy of manners, spicy and amusing in which graceful satire and tart repartees are combined to create the kind of wit - to quote Falstaff - that creates wit in others. Aldo Finzi’s last words to his son Bruno: “let my music be performed”. Sixty eight years on, the composer’s last work still to be performned, had it’s World Premiere in Teatro Donizetti at the Bergamo Music Festival the 1st December 2012. As a tribute and mementos honouring all of Aldo Finzi’s compositions, Bel Air Music arranged to have this unique event captured on DVD. Free sample from track 1 - start of scene 1.